Japan's ruling Liberal Democratic Party (LDP) has marked its 50th anniversary by formally proposing changes to the country's pacifist constitution. The proposals, unveiled last month, would let Japanese troops take part in peacekeeping operations while retaining a 60-year-old ban on waging war. The move is likely to concern South Korea and China, correspondents say. Both countries are worried by what they see as a increasingly nationalistic stance from some Japanese politicians. Japan's constitution was drawn up by the US at the end of World War II and prohibits it from using military force abroad or even maintaining a regular army. Despite these restrictions, Japan's defence budget is the third-largest in the world and its navy the most sophisticated in Asia. 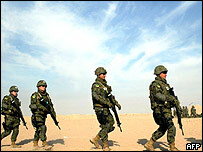 The US now wants Tokyo take on more regional security duties. 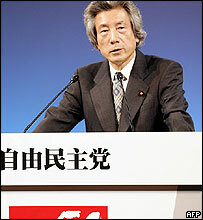 Prime Minister Junichiro Koizumi told his party it was time for change. "We need to take up the challenges of strife and conflict that may face international society over the next 50 years," he said. According to the BBC's Jonathan Head in Tokyo, the LDP is a party with almost miraculous instincts for survival - an unwieldy coalition of bureaucrats, business leaders and small-town politicians that has bounced back from the verge of destruction several times. Mr Koizumi fought a general election this year, taking on the conservative wing of his own party, and won a resounding victory.